Thanks to TypeScript, we’ve been able to improve the quality of our code, improve our productivity and create our fabulous Playground we’re so proud of: http://www.babylonjs-playground.com/, which provides auto-completion in the browser! We’ve also been able to welcome some new team members coming from a C# background and few JS skills with no pain. But thanks to the TypeScript compiler, we can also test the future without rewriting a single line of code! We are still coding babylon.js using Visual Studio and TFS while pushing in a regular manner our code to the github repo. 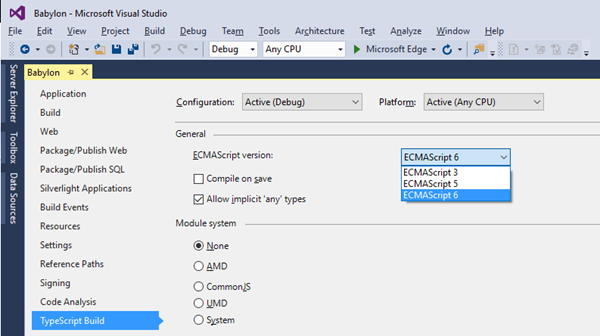 By upgrading our project to Visual Studio 2015 RTM, we’ve been able to upgrade it to TypeScript 1.5. Recompile the solution and you can test the future of ES6 today. I’ve published an ES6 version of babylonjs.com here to let you play with it. You’ll note you need a very recent modern browser such as Microsoft Edge to be able to execute this demo and code. Microsoft Edge and Firefox 41 are currently the most advanced browsers in ES6 support. You can check your current browser ES6 support here. 67% of ES6 features supported in MS Edge and 68% in Firefox 41 out of the box. Those results are impressive! 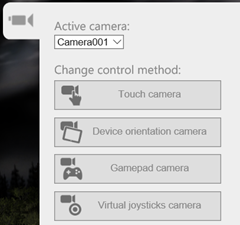 The “class” keyword is not supported yet for production. This is because the spec has changed recently and all browsers are thus putting it behind a flag. To make this demo works in Firefox or Chrome, you’ll probably need a nightly build.